We're now dipping into our archives and gradually reissuing popular posters as 5x7-inch note cards. You can buy them individually or in packs of six. 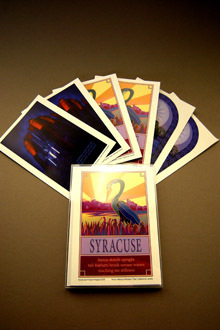 The cards are printed in Syracuse on study cover stock, and each comes with a white wove envelope, packaged in a clear plastic sleeve. All cards are blank on the inside. We're starting with a handful of cards and adding more as our funds allow. Send them to wandering friends and family who wish they could be in Syracuse. 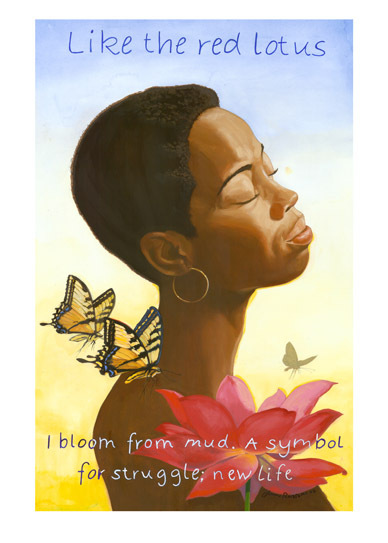 From the 2008 series, by poet Kali Huff and artist James Ransome. Poem: Like the red lotus / I bloom from mud. A symbol / for struggle; new life. Same as above, in a pack of six. From the 2014 series, by poet Rosalyn Carroll and artist Abby Lossing. 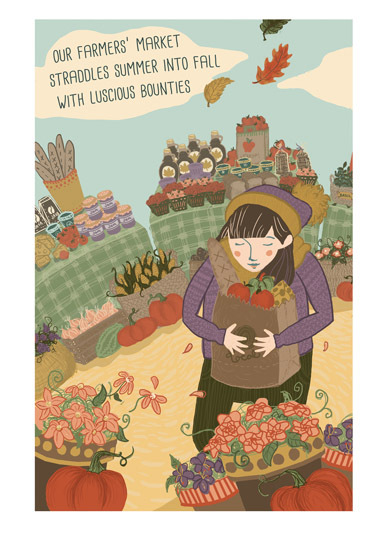 Poem: Our farmers' market / straddles summer into fall / with luscious bounties. From the 2015 series, by poet Cynthia DeKing and artist Frances Matos. Heron flying over historic Syracuse National Savings Bank, Clinton Square. 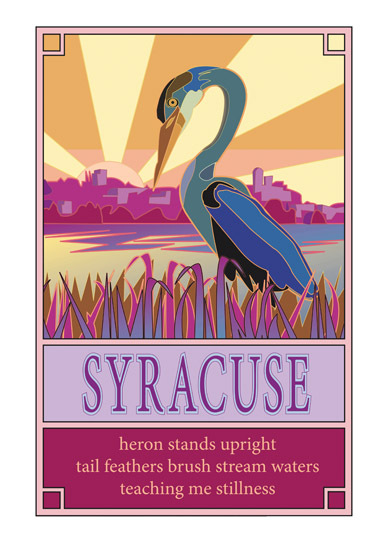 Poem: Blue heron floats by, / wingspan blocking the sun's rays. / My breath catches me. 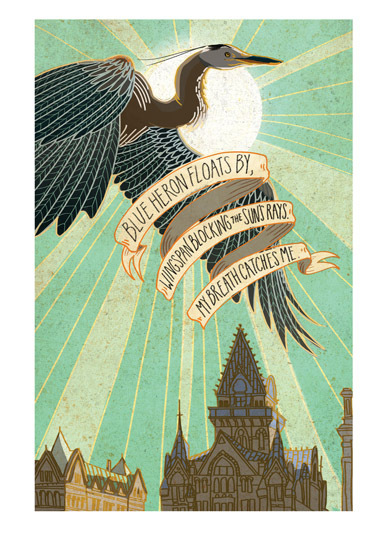 By poet Michael Sickler and artist Scot Connor, from the 2002 poster series. Depicts the Niagara Mohawk building (1932), now the headquarters of National Grid. 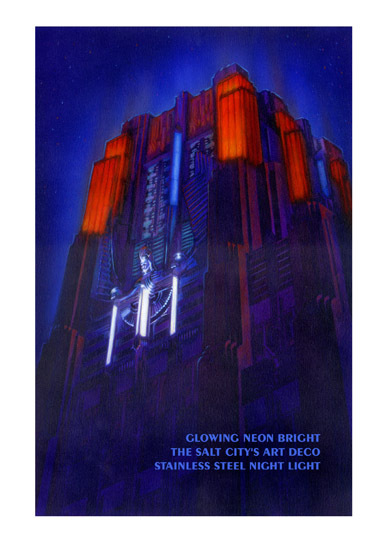 Poem: Glowing neon bright / The Salt City's art deco / Stainless steel night light. From the 2005 series, by poet Robert Gaurnier and artist Katharan Wilkes. 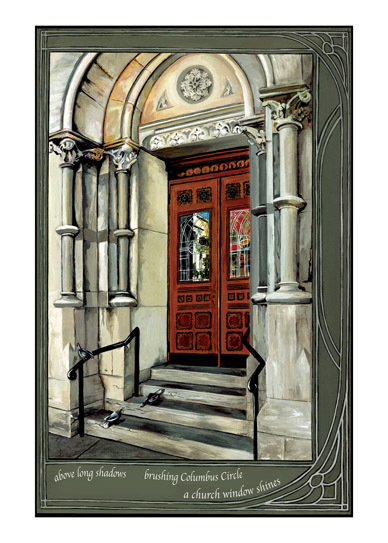 Picturing the main door of the Cathedral of the Immaculate Conception. 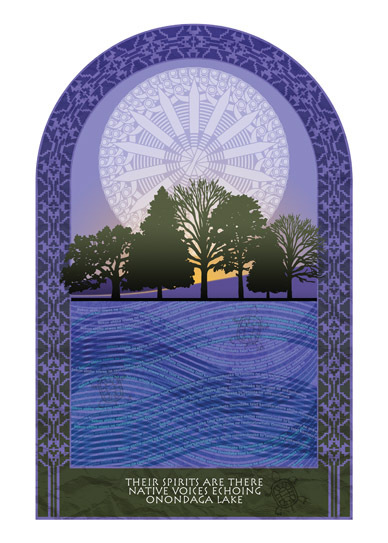 From the 2005 poster series, by poet Catherine Landis and artist Alexius Wronka. 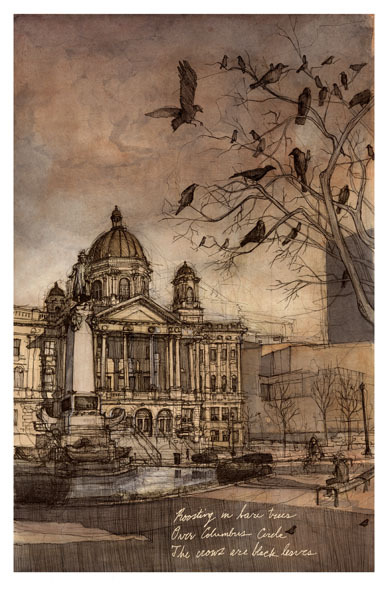 Roger DeMuth, the professor who taught Alexius, says this image makes Syracuse look like Cairo. Send it to friends in Egypt. From the 2005 series, by poet Mark Shevalier and artist Randi Moody. The image includes references to the Hawley Green neighborhood. 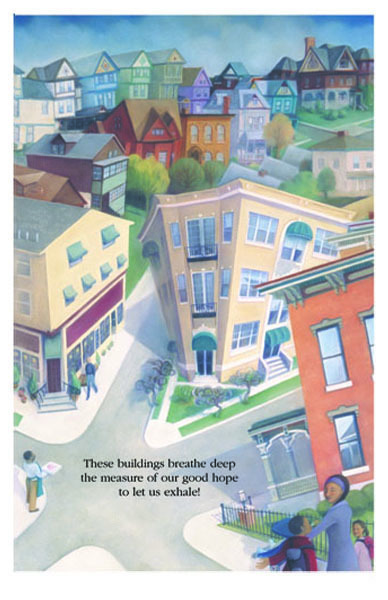 Poem: These buildings breathe deep / the measure of our good hope / to let us exhale! From the 2006 series, by poet Joan Cofrancesco and artist Toni Toland. The image includes graphic references to the Mohawk language, the Turtle Clan, and native basket weaving. 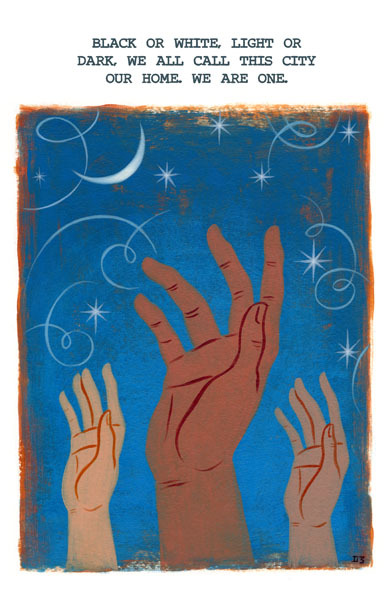 Based on the most popular poster of the 2009 series, by poet Doreen Miori-Merola and artist Danielle Ceneta. A lovely pen-and-ink depiction of Columbus Circle. From the 2009 series, by poet Matt Sattler and artist Don Kilpatrick. Based on a reverse process poster, in which the image came first, poem second. Poem: Black or white light or / dark. We all call this city / our home. We are one. From the 2010 series, by poet Michele Reed and artist Casey Landerkin. 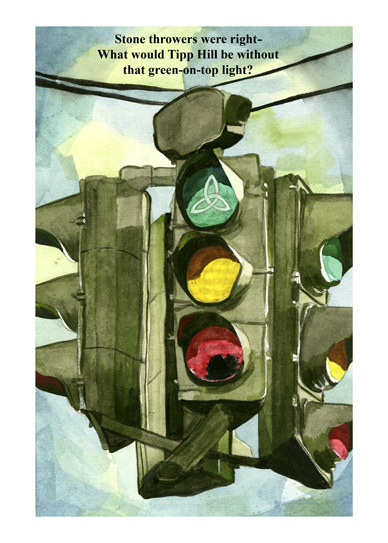 Depicting the altered traffic light at Tipp Hill. Poem: Stone throwers were right-- / What would Tipp Hill be without / that green-on-top light? From the 2012 series, by poet Sara Parrott and artist Skip Frost. Marking the 50th anniversary of Onondaga Community College. 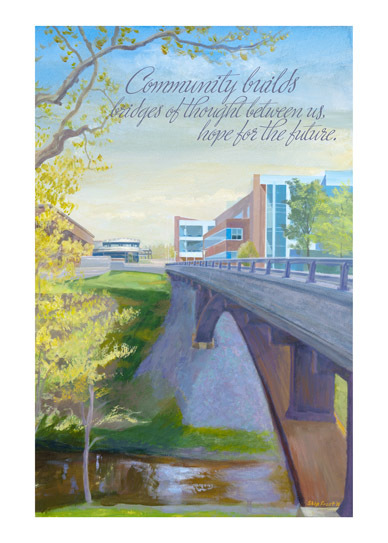 Poem: Community builds / bridges of thought between us / hope for the future.